Banc De Binary ceased its binary brokerage activities on March 5, 2017. The review below is presented for the archiving purposes. Banc De Binary is among the most prestigious and well-known binary options brokers out there. The company is now based in St. Vincent and the Grenadines. Currently, they are not regulated by any government institution. While Banc De Binary is a SpotOption white label like many other brokers, you’ll notice the difference the moment you visit their website. The site doesn’t have that interchangeable look, and it has far more resources and features than most, not to mention much more thorough information. You’ll discover more resources, bigger bonuses, live customer service which is truly 24/7, and a functional demo account as you explore the site. We always try to push new traders in the direction of demo testing before trading live. Brokers usually make this difficult or impossible by only providing limited demo testing capabilities or none at all. That’s not the case with Banc De Binary. You’ll be given a practice account with $50,000 or equivalent to test trades on before you trade live. You do need to register and deposit in order to open the demo account, but it offers you a great opportunity to make sure that binary options trading is for you before you spend money on trades. To open an account (demo or live), start out by depositing $250 or the equivalent in Euros. This is the minimum amount; if you deposit a higher amount, you can qualify for a bonus and other benefits (see the account tiers page). Deposit methods include credit card, wire transfer, and Skrill. You’ll find that there are no fees for deposits or withdrawals, even wire transfer withdrawals. We didn’t find any reference to a withdrawal minimum either, which is a great sign that this broker is trustworthy. It’s also listed in the demo account terms that if you decide you don’t want to trade live, you are free to withdraw your $250 deposit without spending any real money. When you are ready to trade live, you’ll find a great deal of flexibility at your fingertips. There is a mobile platform if you want to trade on your iPhone or Android. The familiar SpotOption platform is easy to use. One of the special benefits of Banc De Binary is that you can trade as little as $1 or as much as $8,000. Trading with $1 is nearly the same as demo testing, so that’s great if you want to start trading live but either don’t have a lot of money to use or don’t want to risk much to start out with. We counted 80 currencies, commodities, stocks, and indices to trade. 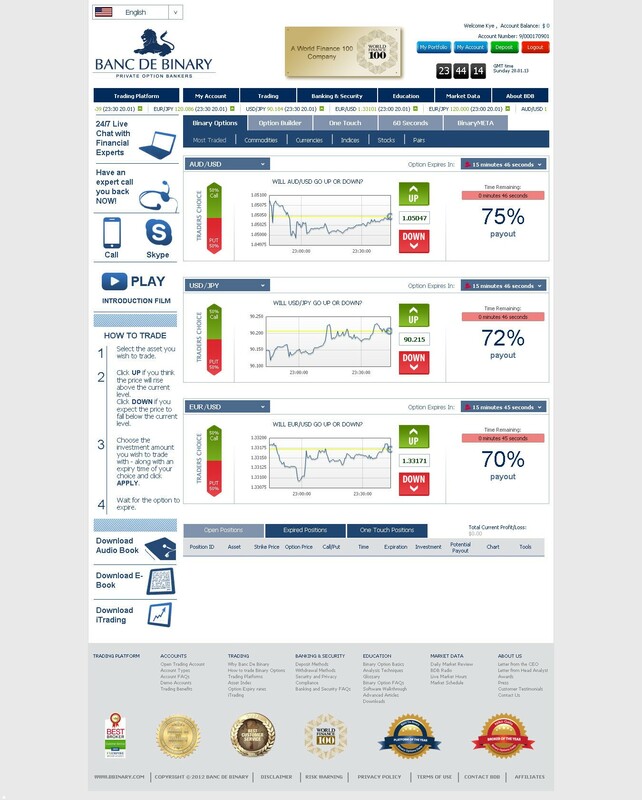 Types of trading available include High/Low, Option Builder, One Touch, and 60 Seconds. The Option Builder lets you set expiry times on your own, which is a key feature to search for in any binary options broker’s platform. Another area where Banc De Binary excels is in providing traders with tools for success. Educational resources and trading tools include a glossary, FAQ, articles on trading (not enough, but a good start), daily market reviews, BinaryMETA (an enhanced platform), an audio book, an Ebook, video tutorials, and if you deposit extra, account management, classes and trading signals. One very cool feature of Banc De Binary is that you can chat 24/7 with experts no matter what type of account you open. This means that expert trading advice is included at all levels. Lots of websites offer 24/7 customer service, but how many actually follow through? Most of the binary options sites we’ve reviewed don’t even staff their live chat desks during business hours on weekdays. Banc De Binary staffs their live chat desk 7 days a week, just like they advertise. We were able to talk to a live human being on a Sunday afternoon. That being said, that person was not as helpful as we would have liked, though he did make an effort. To be fair our question was a bit obscure, and would require him to research to find an answer. So while we’ve enjoyed more useful service before, this is the most available service we’ve found to date, and it wasn’t bad service by any means. When we clicked on the live chat link, it said we had 7 seconds to wait for a representative to show up. In exactly 7 seconds, someone was there. We’ve had other sites tell us we had three minutes to wait and thirty minutes later, it became obvious no one was ever going to show up. Banc De Binary has won a number of awards, including the prominent World Finance 100 award, as well as Best Binary Options Platform in North America and Asia in 2012 from the same company. We’ve seen numerous positive reviews and testimonials for them online. They’ve been around for a couple of years and have had more time to grow and build reputation than many of their competitors, which makes them more trustworthy than most binary options sites. While Banc De Binary does have some drawbacks (customer service could have been more knowledgeable, a few more trade types would be nice, and we couldn’t find any references to rollover or early closure), it has a lot of advantages. Customer service is truly available during the entire week, there are a lot of training resources, and the company seems to really be encouraging people to try them out with a demo account before risking real money. This commitment to customer service and education points toward a broker that is looking for long-term customers. 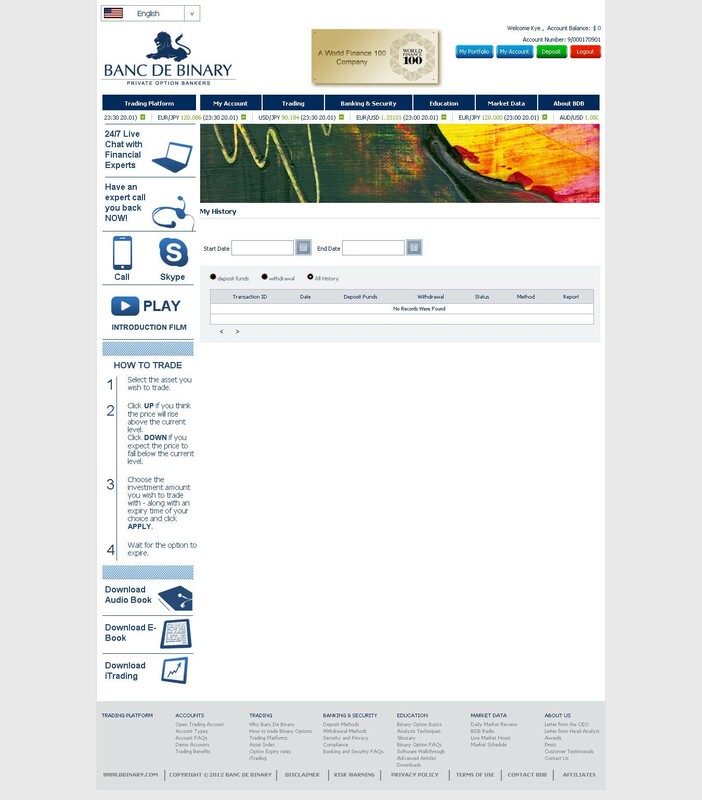 If you’re interested in trading binary options, try opening a demo account with Banc De Binary. Test out their customer service team with questions you have. Read other customer reviews. This broker is far worthier of your consideration than the vast majority that we’ve checked into. been no contact from your company. Could you please advise as to what happen, hear from you soon. No help from their tech. support – I emailed my ID documents to 4 of their different email addresses but finally got a reply saying no docs were ever attached. No help from their tech. support – I had to figure out on my own to change to Chrome browser for my docs to finally go through. But the killer was their slow platform. After trades closed in the money, the platform continued the ticker while it said “Verifying, verifying…” for 3 full seconds! while the trade ticker continued to move, then it said lost out of the money. Over and over again. Trades showed absolute wins, but ‘closed’ losses. Then I couldn’t withdraw the rest of my money until I sent them ANOTHER picture of me actually holding the ID I had already sent them. Got the rest of my money in 4 days fine. But I wrote several times also to say stop calling me, stop emailing me your ads and finally closed the account but I’m STILL getting email ads I don’t want. I will not deal with them again. Very fancy platform but slowest I have ever used – 365Trading is bare spartan without bells and whistles, but closes instantaneously. That is the only thing that puts wins in my account.